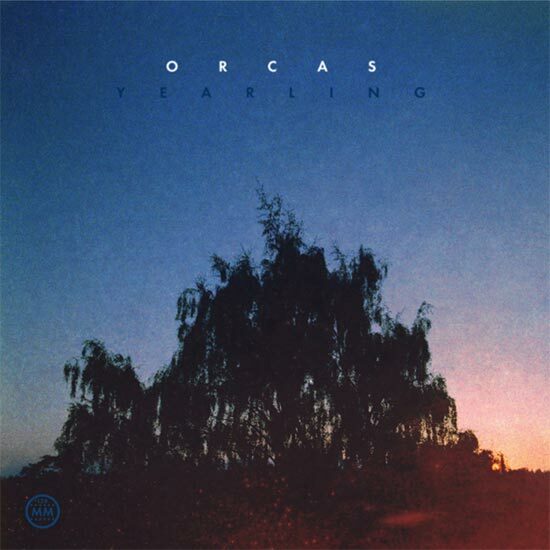 Yearling, the second album from Orcas — the collaboration of Thomas Meluch, better known as Benoît Pioulard, and Rafael Anton Irissari, who also makes graceful ambient shoegaze under the name The Sight Below — seems very intent on a time and a place. In this case, a summer in Germany, where most of these songs were written. To shift between subject and setting, Yearling switches between ambient drift and yearning ambient pop, with plaintive vocals courtesy of Pioulard. This can be seen most evidently in the one-two punch of album openers “Petrichor” and “Infinite Stillness”, the former being a glowing nimbus of field recordings and swelling organs that sound like the backlit tree on the album cover, and “Infinite Stillness” being a piece of epic now wave splendour, with solid, stately drum machines and a plodding bassline and the first appearance of Pioulard’s angelic vocals, that brings to mind the best era of The Cure. With a couple exceptions, this more song-oriented approach is a new feature of Orcas’, whose self-titled debut was more focused on improvisation and ambiance. Most of Yearling was already written in the summer of 2012, and having a backbone to work off allows the music to be both loose and organic while still being tight, controlled, and ultimately, more human and more personal than any of the participants’ solo careers. This symbiosis of ambiance and pop craftmanship is best illustrated by the third track, “Half Light”, with its romantic, futuristic synthline and heartbreaking vocals heralding a new, new romanticism, a blending of the futurism of synthpop with a dash of nostalgia. It’s like driving in a sleek German automobile, on smooth roads with the windows cracked, while still occasionally looking in the rearview. This illustration of looking both backwards and forwards, simultaneously, is a pretty apt synopsis of Yearling; it seems focused on memory and reflection. The blurry impressionism of the synths, mixed with the distance of the reverbed vocals, gives the feeling of lamentation, but also appreciation. I’m not sure what happened in that summer in Germany, but it seems Meluch misses it. There is a cracked honesty about this record, a tugging at the heartstrings, that speaks to beginnings and endings. It seems also that Orcas are taking inspiration from everywhere, drawing upon the giants of art pop to structure their sounds, to provide a framework upon which to place their gauzy drift. I don’t like to compare bands to other bands or records to other records all that often, but Orcas mention Spirit Of Eden-era Talk Talk and Air’s The Virgin Suicides Soundtrack, so if they’re being open about it, so will I. The first, and best, comparison, is the art rock of Eno’s vocal records, most notably Another Green World, which intersperses its romantic pop with ambient soundworlds and flying guitar solos from Robert Fripp. In the case of Yearling, the role of Fripp is played by Martyn Heyne from the experimental folk band Efterklang. These moments of ambiance prevent Yearling from becoming maudlin, and instead, make it just lovely. Other sonic similarities include the faraway pastoralism of Bon Iver, the old TV saturation of older Future Islands and even Boards Of Canada or Black Moth Super Rainbow, a bit. Orcas sound like a more open-hearted Radiohead, stripped of paranoia and cyncicism. And, of course, the already mentioned titans, Talk Talk. The comparison to Talk Talk is a good way to frame an interesting thing about Orcas. There are so many possibilities, with the ability to shape and sculpt sounds, to create new and dramatic visions in your mind, to light up your imagination, to show you something new. This exercise in structure and restriction, this foray into songwriting, suits these musicians well, bringing out their best. It’s way more raw, real and immediate than the works of either Pioulard or The Sight Below (both of which I also adore; don’t get me wrong). They’ve created an artifact of transcendent beauty, and, ultimately, managed to communicate the essence of a particular time and place, as well as themselves, in the process. J. Simpson is attempting the unlikely, seeking to master 3 separate, but interlocking traditions: music, audio production, and writing. As you can probably imagine, he drowns in sound and wallows in noise, and writes down the effects, using himself as a guinea pig for psychoacoustic experiments.J. Simpson has written about music for REDEFINE, Freq Magazine, The Active Listener, Weirdo Music, and Chain DLK, and writes about horror for Amazing Stories. He is the founder and author of the Forestpunk journal, as well as co-founder of the Bitstar art and music collective. He also makes music with the love of his lifetime in the band Meta Pinnacle, and solo under the name Dessicant. He lives in Portland, OR.